On May 24th, 2018, we participated in one of the largest family caregiver events of the year. Internationally renowned Naomi Feil shared her validation therapy method of caregiving. Over 350 family caregivers and healthcare professionals attended the event at San Antonio College in Texas. 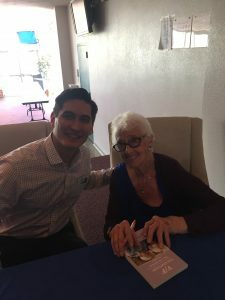 The workshop was organized by the Alamo Caregiver Support Coalition and chaired by the Director of Community Relations at Griswold Home Care – Ryan McGuire. The Alamo Caregiver Support Coalition is a sub-committee of the Alamo Area Council of Governments (AACOG) and made of volunteers passionate about supporting family caregivers. The Validation Workshop was just one of the many great resources they provide for family caregivers. Naomi Feil is a social worker and gerontologist who developed validation therapy. Validation therapy “helps confused older persons with cognitive impairments and dementia.” Her approach classified individuals with cognitive impairment as having one of four stages in a continuum of dementia. The goal of this method is to improve communication between caregivers and dementia care recipients. Validation helps “reduce stress and enhance dignity and happiness.” Those with cognitive impairments who are confused or retreat into fantasy can be brought back to reality with this method. It is based in empathy and compassion. The workshop provided incredible insight and training for family caregivers. Through Neomi’s role playing, video and power point presentation family caregivers were able to develop real tools and strategies they can use when communicating to their loved ones. Following the workshop one participant said, “I heard Naomi speak thirty years ago in San Antonio. She is still as insightful and energetic as ever. She is wonderful and a prime example of aging with beauty and finding integrity in your golden years”. You can view her summary of the presentation here, and you can learn more about her on her website.